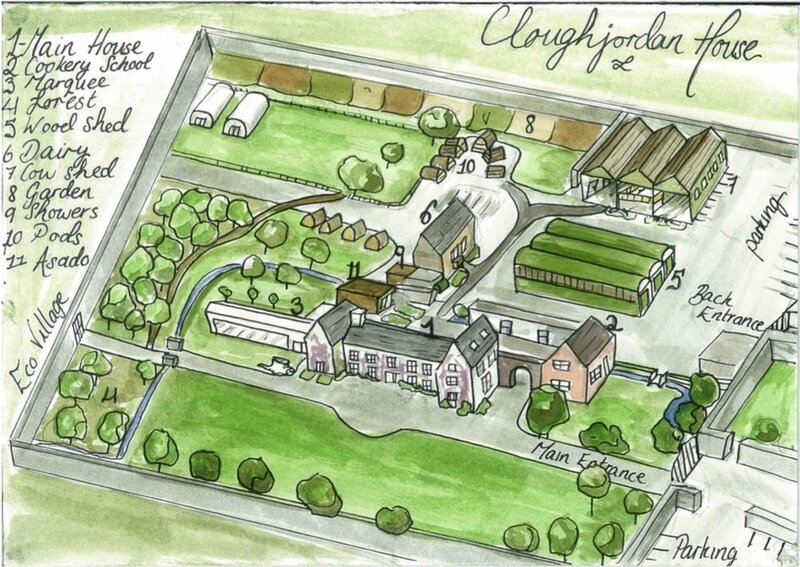 Cloughjordan House has a variety of colourful accommodation options for guests. 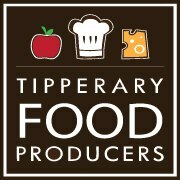 There is on-site accommodation for up to 85 guests. 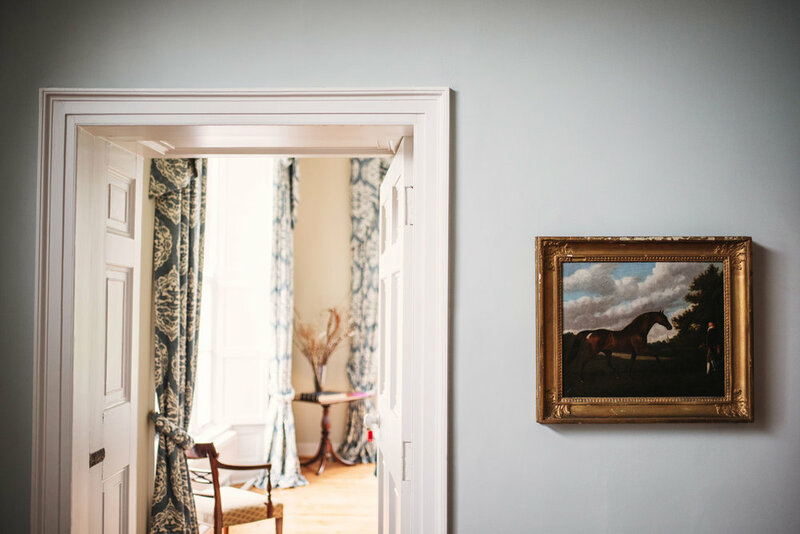 The attention to detail leaves each finished room with a sense of its own personality and flair, meaning every lodger has a unique experience of the venue. The bathrooms are stocked with Orla Kiely toiletries and the property is littered with Nespresso machines so that guests can take a break during their stay to sit back and smell the coffee. There are four double bedrooms with ensuites in the beautifully elegant main house. 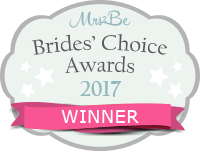 The bedrooms have all the glamour of period features but with modern adjustments for a more comfortable stay. 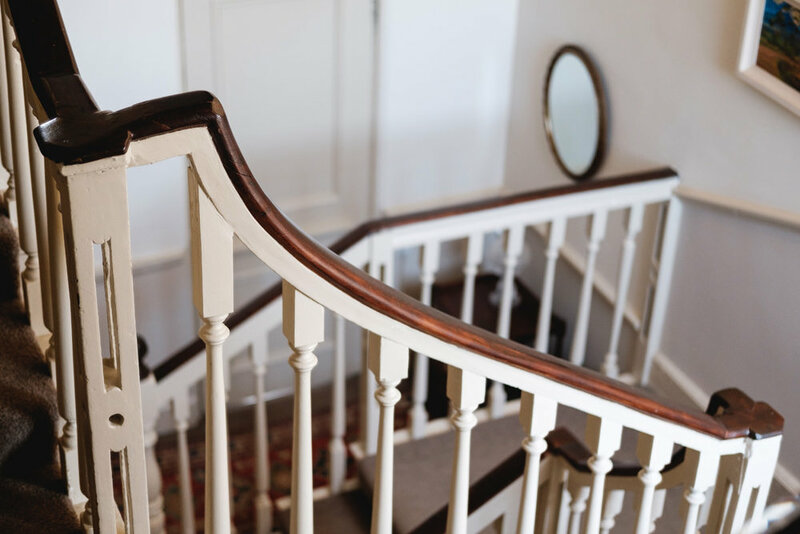 Guests staying here are steeped in luxury with; super king sized beds, crisp Egyptian Cotton sheets, soft cashmere blankets from Hanly Woollen Mills and under floor heating in the bathrooms. They also have use of the sitting room in the main house for relaxing and tea/coffee facilities with homemade cookies. Sleeps 8. There are two double bedrooms with ensuites above the cookery school. These rooms are an extension of the accommodation available in the main house. Guests have access to the living rooms there for relaxation. This building was originally a store for horse-drawn carriages, hence its name The Coach House. Sleeps 4. There are four double bedrooms with ensuites located in the Dairy. The structure was the original milking parlour for 150 dairy cows which is why each room; Daisy, Bluebell, Buttercup and Primrose are named after the animals. The décor here is rustic with unique features making use of Cloughjordan farm wood and other farmyard materials like galvanised sheeting. The beds are traditional farm structures with super comfortable mattresses. The handcrafted nature of these rooms means you are guaranteed to have never stayed anywhere like this. Sleeps 8. There are 18 bedrooms with ensuites located in the Cowshed. 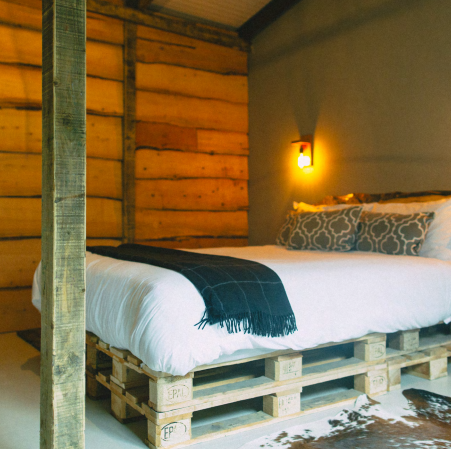 The bedrooms are farmyard inspired with wood used from the Cloughjordan House forest and wooden sinks and rugs from South Africa, where both Sarah and Peter love spending time. The beds are large and luxurious and the showers are powerful. The common room is like something out of a novel, spacious and bright with an Argentinian feel. The veranda opens out onto the property with big, comfortable couches complete with blankets for the ultimate in chilling-out and when the sun is shining this is the best spot in the house (or shed)! Sleeps 45. 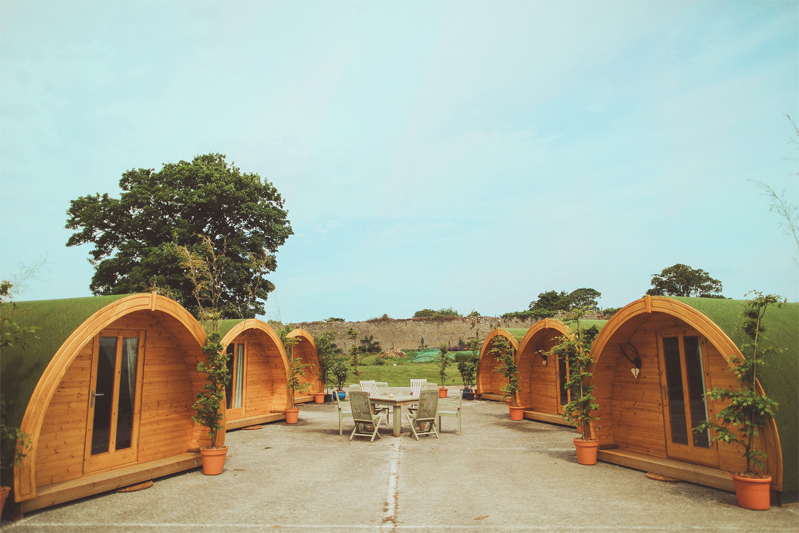 The glamping area in the walled garden has 9 newly arrived wooden "pod" cabins offering Scandinavian comfort and style. Mattresses and bedding are the same as any of the other rooms in the house. In order to keep our guest’s stay as premium as possible, we have built a Pamper Room so that ladies can get ready in comfort for the day ahead. This Girlie Room is bright and spacious and comes complete with mirrors and plugs for appliances. 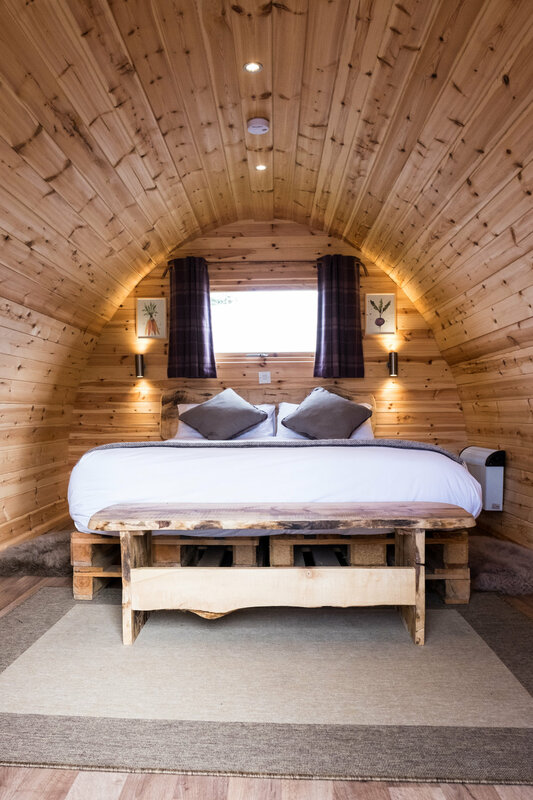 Glamping guests have access to The Cowshed lounge for relaxing and chilling-out. Sleeps 18. The newest addition to the Cloughjordan House experience is glamping. We have recently installed 2 boutique camping bell tents which are spacious with ultimate comfort and a festive feel. Like the Pods the mattresses and bedding are the same as any of the other rooms in the house. 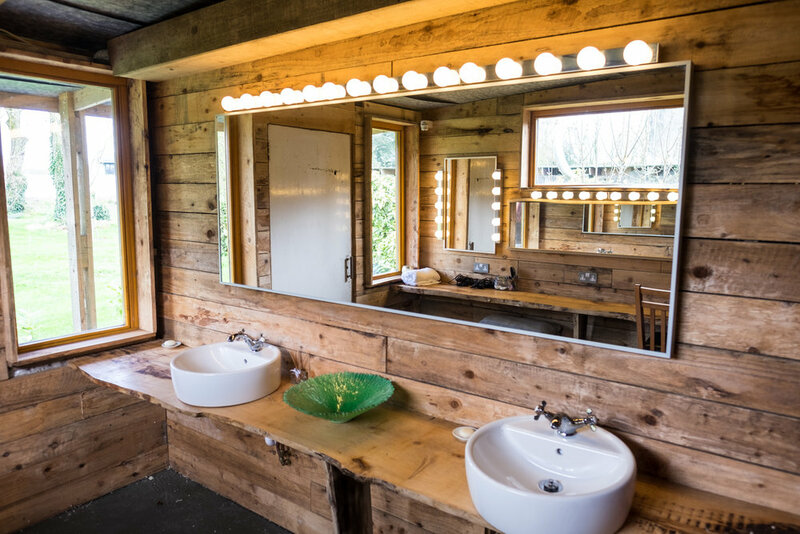 As above glamping guests have access to The Cowshed lounge for relaxing and chilling-out and the Girlie Room. Sleeps 4. 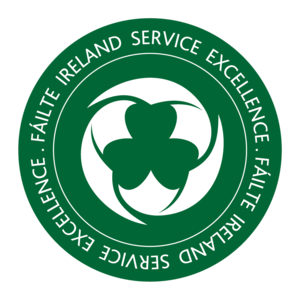 Here in Cloughjordan House we are committed to ensuring our venue is as accessible as possible, accommodating a variety of guests’ personal needs. The Cowshed is home to two wheelchair accessible bedrooms, complete with wet room showers and ramp access. All other bedrooms in the Cowshed have one step at their entrance. One of the four Dairy bedrooms is on the ground floor, all others are located upstairs. Both bedrooms in the Coach House are located upstairs, above the Cookery School. The main house bedrooms are all in the upper levels of the house, two on the first floor and two on the second floor. There is a public bathroom that is wheelchair accessible located in the main house, alongside the ladies and gents bathrooms. All of the main reception rooms are located on the ground floor of the house. Likewise, there is a pathway leading from the main house all the way to the cowshed, at the rear of the property.